World Interfaith Harmony Week is a UN resolution for a worldwide week of interfaith harmony proposed in 2010 by King Abdullah II and Prince Ghazi bin Muhammad of Jordan. The World Interfaith Harmony Week falls in the first week of February of every yearand aims to promote harmony between all people regardless of their faith. It is [also] essential to resist forces of division that spread misunderstanding and mistrust especially among peoples of different religions. The fact is, humanity everywhere is bound together, not only by mutual interests, but by shared commandments to love God and neighbour; to love the good and neighbour. This week, my delegation, with the support of our friends on every continent, will introduce a draft resolution for an annual World Interfaith Harmony Week. What we are proposing is a special week, during which the world’s people, in their own places of worship, could express the teachings of their own faith about tolerance, respect for the other and peace. I hope this resolution will have your support. On October 20, 2010, Prince Ghazi bin Muhammad of Jordan, Special Advisor and Personal Envoy to the King Abdullah II and author of the resolution, presented the proposal for a World Interfaith Harmony Week before the UN General Assembly in New York where it was adopted unanimously. The draft resolution A/65/L5 titled the World Interfaith Harmony Week put forth by Jordan was sponsored by 29 co-sponsors – Albania, Azerbaijan, Bahrain, Bangladesh, Costa Rica, the Dominican Republic, Egypt, El Salvador, Georgia, Guatemala, Guyana, Honduras, Kazakhstan, Kuwait, Liberia, Libya, Mauritius, Morocco, Oman, Paraguay, Qatar, the Russian Federation, Saudi Arabia, Tanzania, Tunisia, Turkey, the United Arab Emirates, Uruguay and Yemen. Organisation from around the world are invited to set up events promoting interfaith harmony, with the added incentive of 3 annual prizes sponsored by the King of Jordan, in the amount of $25000, $15000 and $5000 with a corresponding gold, silver and bronze model. 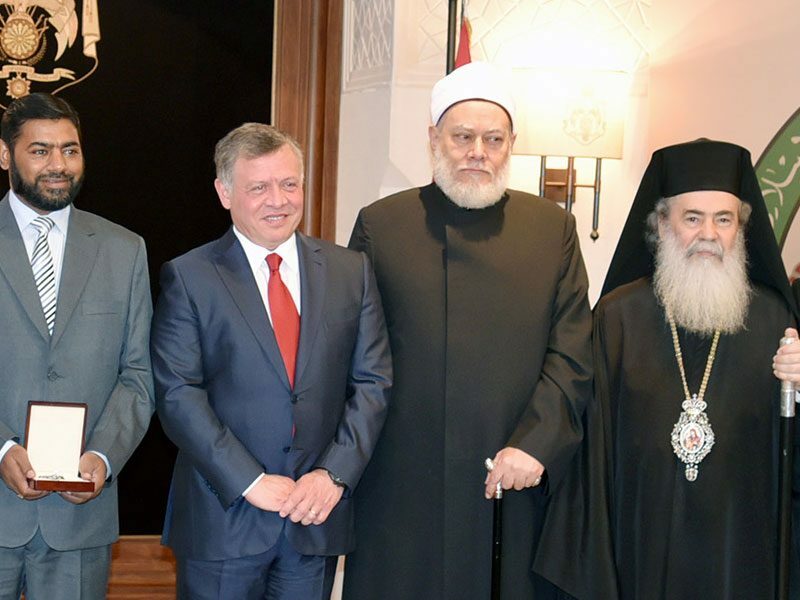 The prize, personally presented by the King at a ceremony in Amman, is awarded based on a decision of a jury composed, among other personalities, of Princess Areej Ghazi and Patriarch Theophilus of Jerusalem. 2014: Second Prize – Mohd. Abdul Saeed Khan alias Saeed Khan Falahi of Shahjahanpur, Uttar Pradesh, India. In February 2015, British singer-songwriter and composer Sami Yusuf released “The Gift of Love”, he called an “Interfaith anthem” to coincide with World Interfaith Harmony Week. The music video was filmed in Jordan (at Petra, at the baptism site of Jesus, Wadi Rum) and in holy sites in Jerusalem. http://acommonword.com/en/component/content/article/414.html Archived October 21, 2010, at the Wayback Machine. David Tusing (3 February 2015). “Sami Yusuf releases his “Gift of Love” – British singer’s new song out to mark World Interfaith Harmony Week”. Retrieved 31 March 2015.